Srinagar, August 8Four militants were killed and a Special Forces soldier injured in a fierce gunfight in a thick forest area of north Kashmir’s Sopore sub-district on Wednesday, officials said.The militants were killed in Baramulla’s Dooniwari forest area as the gunfight raged through the day. Army’s Special Forces units were pressed into service, a defence spokesman said.“Four militants have been killed while the operation is still on,” defence spokesman Rajesh Kalai told The Tribune.The exchange of fire between militants and security forces began early morning as security forces cordoned off the jungle area after the police suspected presence of five militants in the area.A soldier from Army’s elite Parachute Regiment was injured in the initial firefight and was hospitalised with a bullet injury in the thigh, the officials said.Helicopters were pressed into service to transport soldiers even as the counter-insurgency operation was put on hold for the night.A police official said the cordon was intact. “It is a thick forest area and movement is difficult during evening and night, so we have put the operation on hold and will resume it at the first light on Thursday,” he said.No bodies of militants had yet been recovered and the identity of the outfit involved was not immediately known, the official said.This is the second major gunfight in north Kashmir in two days. 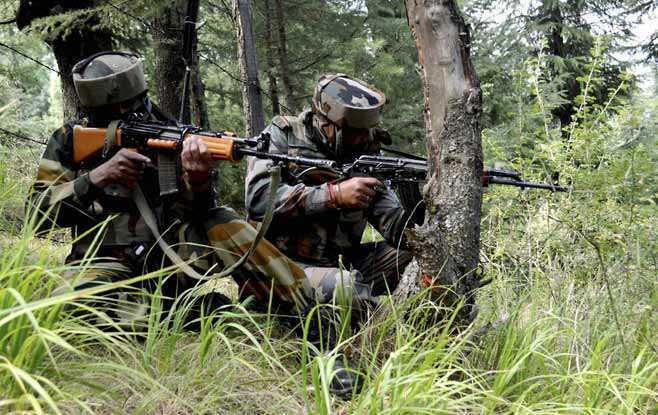 On Tuesday, four soldiers, including a decorated Major, and two militants were killed in Gurez sector of Bandipora.